Indigenous Eye Health in collaboration with Indigenous Hip Hop Projects (IHHP) and support from CDC delivered an art mural and hip-hop dance project in Nyirripi and Willowra in the Northern Territory over two weeks in November 2017. Street artists Adnate and Kali worked with community members to design and paint a public art mural to portray the story of their community, and to also include Milpa and the ‘Clean Faces, Strong Eyes’ message. IEH delivered trachoma education sessions at the school, early childhood centres and youth services followed by a hip-hop dance workshop delivered by IHHP dancers Jess Brooks and Zeke Thompson. 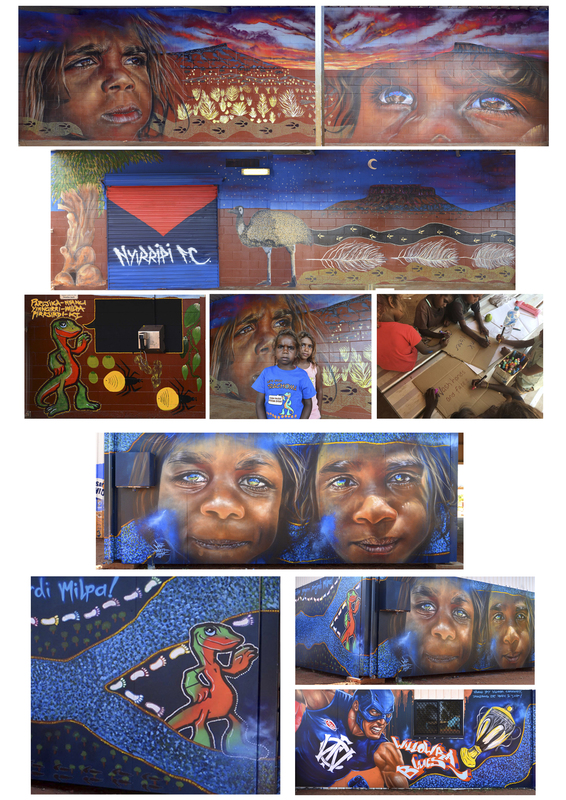 In Nyirripi, Adnate and Kali worked with local artist Robin Brown and community members to design and paint an amazing art mural at the community Outback Store. In Willowra, the artists worked with many community members paint the Warlpiri Youth Development Aboriginal Corporation (WYDAC) sports and recreation space. Each week finished with a community concert where the school children performed their dance routines and there was a special appearance from the Milpa the Trachoma Goanna.